Ruth May notices the children in her new home. They have strange names and, in spite of their hunger, big bellies. One little girl stole one of Ruth May’s toys. Ruth May isn’t sure if the little girl should be considered a sinner, as Nathan says, or if she should be forgiven, as Orleanna thinks. Ruth May is too young, innocent, and sheltered to understand the concept of malnourishment. One symptom of starvation is a swollen stomach. Ruth May considers her other neighbors, like Mama Mwanza. Mama Mwanza’s house burned down several years ago, scorching her legs, which later had to be amputated. Orleanna tells Ruth May that Mama Mwanza has a hard life now: she has to take care of her husband and her many children, even though she can’t walk. She moves around on her hands, and carries her possessions on a basket on her head. The notion that somebody could survive in a tiny village without use of one’s legs is remarkable, but it suggests that the Congolese are mature and hardworking, in stark contrast to the way Nathan views them. Ruth May reports that Rachel has become badly sunburned. Nathan thought that being in the Congo would be good for Rachel, because it would make her less vain and superficial. Orleanna complains that the villagers look upon the Prices as “freaks of nature.” She also encourages her children not to point at the African villagers. Ruth May remembers something Nathan said: the Africans are “living in darkness.” Orleanna disagreed with Nathan, saying that the Africans think of their bodies as objects to be exhausted and worn out over time. Nathan finds this idea disgusting. Orleanna seems more in touch with her family’s place in the community than Nathan does: she recognizes that although Rachel finds the Congolese ridiculous, the Congolese find the Price family even more ridiculous. Nathan simply can’t accept this way of looking at things: from his perspective, he’s right and the Congolese are wrong. Orleanna’s ideas about the human body—that it’s not a sacred thing, but merely another object—are sophisticated, so naturally they displease Nathan. Ruth May remembers her father’s rocking chair back in Georgia, a chair that only Nathan was allowed to sit in. Ruth May and Orleanna laugh about the chair, because someone else—probably the father of the family to whom the Prices rented their home—is sitting in the chair right now. Arn, Jackson. "The Poisonwood Bible Book 1, Chapter 8." LitCharts. LitCharts LLC, 29 Jun 2016. Web. 18 Apr 2019. Arn, Jackson. "The Poisonwood Bible Book 1, Chapter 8." LitCharts LLC, June 29, 2016. 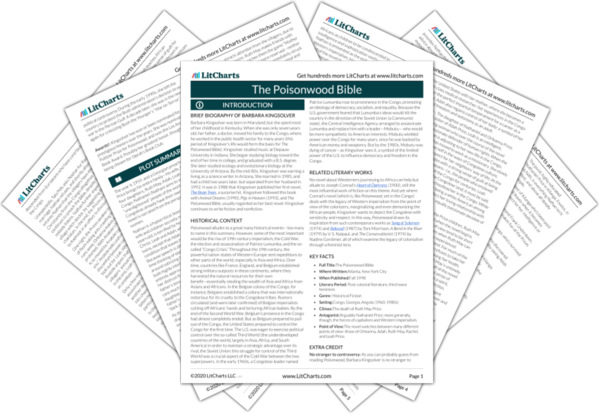 Retrieved April 18, 2019. https://www.litcharts.com/lit/the-poisonwood-bible/book-1-chapter-8.